Brick by Brick: Architects and engineers enlist one of the oldest building technologies to create innovative 21st-century structures. Describe different methods of building brick vaults. Compare the environmental profile of air-cured, earthen brick with that of fired brick. Describe efforts to enhance the durability and strength of air-cured, earthen brick. 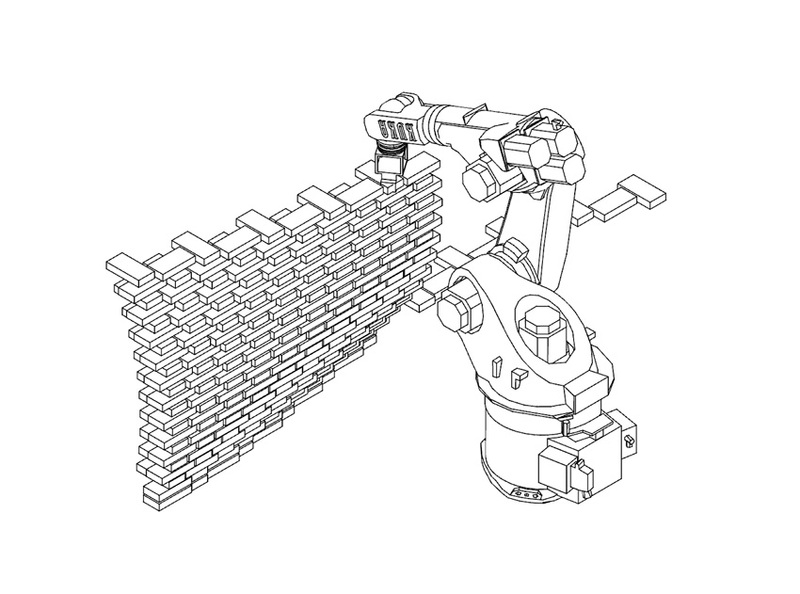 Describe some of the limitations of robotic brick-laying technology. Venice is a city built of bricks and one enriched by the wooden cargo ships that helped lift the former Venetian Republic to greatness. So it’s fitting that last May at the 2016 Venice Biennale, a handful of architecture and engineering students from the Massachusetts Institute of Technology and several European schools joined a team of professionals to build an experimental brick structure in the courtyard of the historic Arsenale, where naval and trading vessels were once constructed. 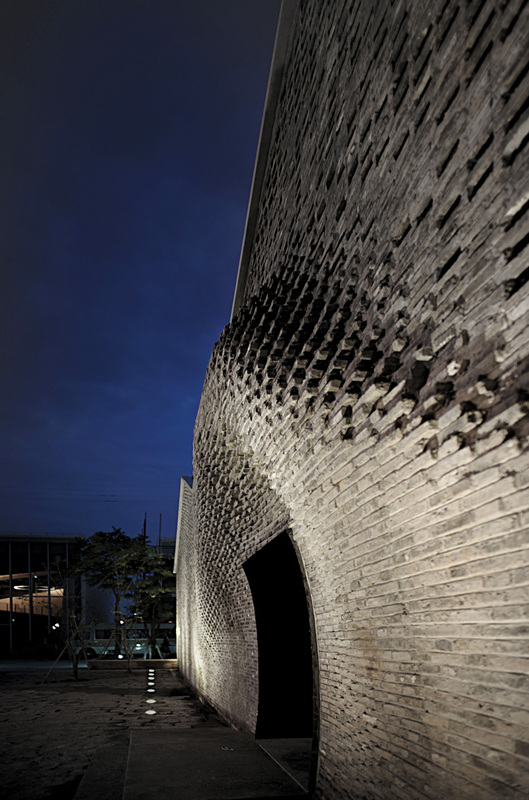 Under the guidance of Foster + Partners architects, the team tested new approaches to traditional brick. Lord Norman Foster, known for his groundbreaking works in steel and glass, developed the design for the graceful, thin-shell masonry vault, demonstrating that common brick, with its durability, relatively low cost, and almost universal availability, continues to inspire form and innovation. 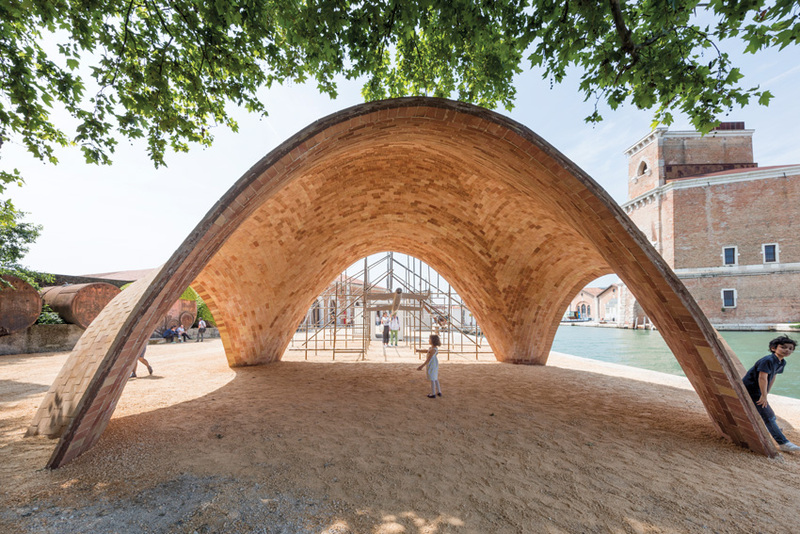 This past summer, a team of architects and engineers built an unusual brick vault at the Venice Biennale. 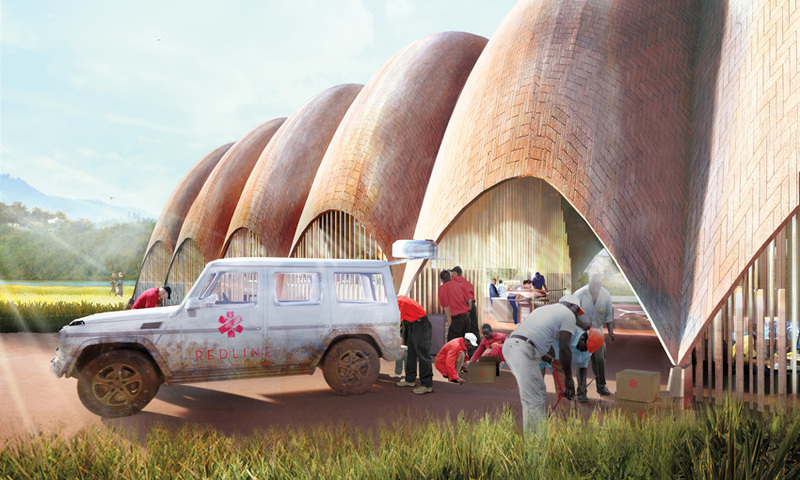 The vault built for the Biennale was a full-scale mockup of a cargo droneport and is an early step in the creation of a network of such facilities for developing countries. The concept is the brainchild of Jonathan Ledgard, director of the Ecole Polytechnique Federale de Lausanne’s Afrotech initiative and its offshoot Redline, a drone developer. The team is currently exploring sites for the first droneports in Rwanda, where, as in many emerging countries, roads are sparse and difficult to navigate. Cargo drones have the capacity to carry small freight such as medical supplies to remote places, and “leapfrog” over the lack of adequate infrastructure, says architect Narinder Sagoo, a partner at Foster + Partners. Foster’s idea was to create a module that could be replicated and expanded by combining the units into different configurations, depending on local needs. In addition to housing drones and supplies, part of each facility could also serve community functions, such as a clinic or a post office. Following Foster’s mantra to “do more with less,” the architects worked with engineers from Cambridge, Massachusetts–based Ochsendorf DeJong and Block (ODB) early in the process to optimize the structure. Because the materials for making brick are readily available in Africa, the team decided to explore using an unreinforced masonry system. The first step was a process that John Ochsendorf, an MIT professor of engineering and a partner in ODB, calls “form finding.” Because unreinforced masonry performs well in compression but not in tension, the engineers relied on digital models to find a geometry that works only in compression under all expected load conditions, Ochsen­dorf explains. 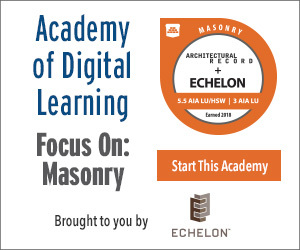 The digital modeling tool they used is similar in concept to the famous experiments in which the Spanish architect Antonio Gaudí suspended chains to find the most efficient shape for arches and domes. When slung between two points, a string or chain will inflect to a curve, or catenary, that is uniformly loaded in tension. If that shape is inverted and constructed of a rigid material like masonry, it forms an efficient arch in compression. The structure was the first step in the creation of a network of cargo droneports for developing countries. The first facilities, planned for Rwanda, would be made of multiple vaults in a variety of configurations, depending on local needs. The technique used to build the droneport is indebted to another Spaniard, Rafael Guasta­vino, who immigrated to the U.S. in the late 19th century. He developed a method of making thin-shelled masonry domes and vaults with little or no formwork. It relied on a quick-drying mortar to cantilever the tiles in place until the finished form was completed. Guas­tavino’s distinctive vaults were incorporated into many notable projects, including Grand Central Terminal in New York and the Boston Public Library. To build the droneport mockup, Foster’s team erected scaffolding and light fiberglass poles sprung into arches every few feet in each direction. Over these temporary supports, they laid three layers of masonry, each at a different orientation, to increase strength. 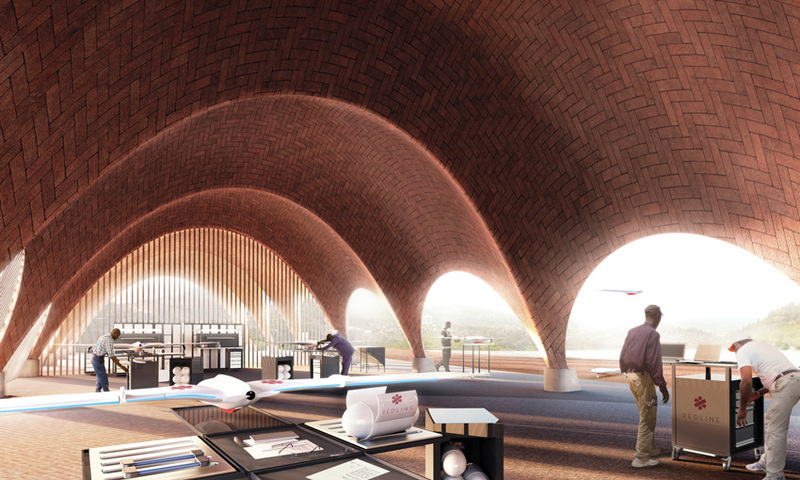 The two outermost layers are made with an experimental 1½-inch-thick earthen brick, developed in collaboration with LafargeHolcim Foundation, a partner in the droneport project. Traditional air-cured earthen bricks, like adobe, typically consist of clay-based soil that contains sand or silt and organic material such as straw. Although easy to produce, these bricks are heavy and lack the strength, durability, and weather resistance of the kiln-fired variety. But those used for the Droneport include a small amount of Portland cement, which strengthens the bricks through a chemical curing process. The formula was conceived for situations where appropriate soils are plentiful but the resources for the energy-intensive production and firing of traditional bricks are scarce. Due to time and technical constraints on the Venice project, the designers specified a 1-inch-thick Spanish-fired brick for the prototype’s initial interior layer. Although the fiberglass poles and the steel for the scaffolding would be imported for the actual drone­-ports, the idea is to rely on bricks made from raw materials found near the building site, Ochsendorf says. 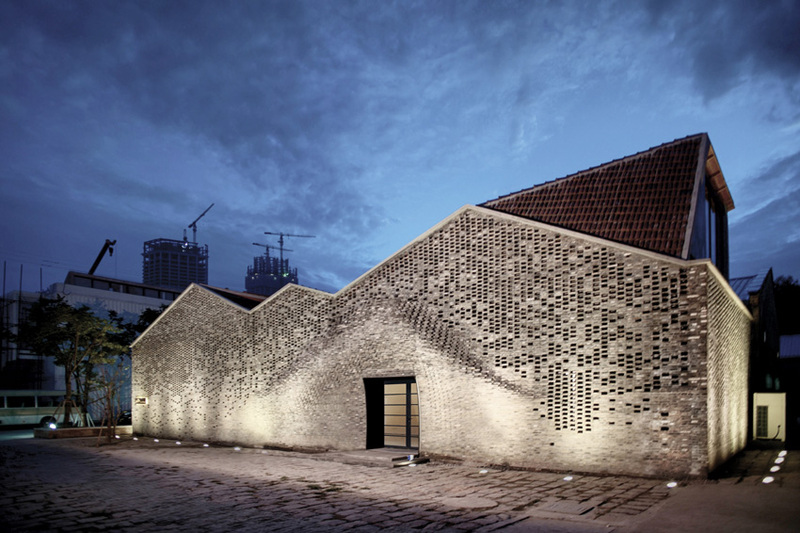 To convert an old industrial building in Shanghai into artists’ studios and a gallery, architects from Archi-Union salvaged the bricks from the original structure. They created the new undulating facade (top and middle) with the help of a bricklaying robot (bottom).